I used to weigh approximately 300 pounds. 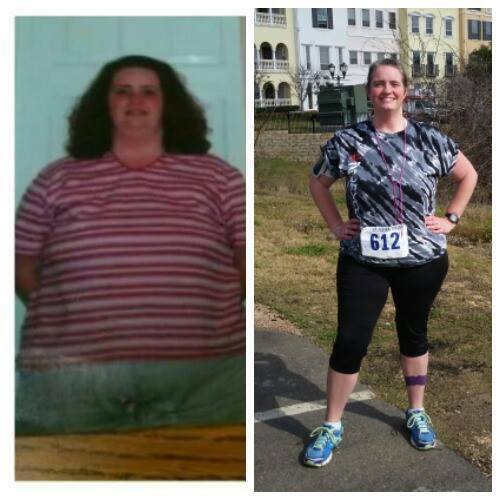 It has been a long journey…but 100 pounds lighter, I just ran my first 10k. Pictured is a 7k I just ran! I hope this inspires others to keep on keeping on! I always found something I liked to do…and then just did it. It was baby steps along the way. I lost 50 pounds before I even took my first step. Then I started walking. Then curves. Then weight lifting. Then Couch to 5K. Then full 5ks. Then a bootcamp. Then mud runs and 10ks. Now, I do Camp Gladiator and found where I belong. Finding the right fit and the people to workout with and encourage you, keeps me going…daily. baby steps….and courage. You have to step out of your comfort zone. Now…I do it to inspire others and show them they can do it too! This entry was posted in Favorite Runners and tagged favorite runners, runners.